ATO Press-Center released another report today. 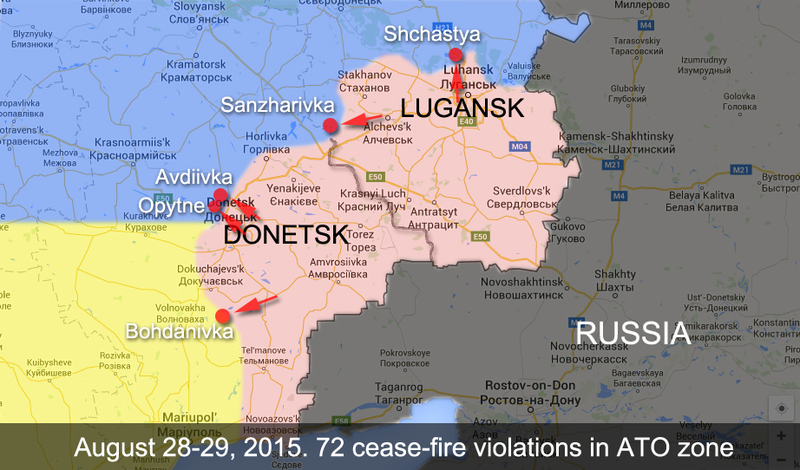 In general in the last 24 hours pro-Russian insurgents violated cease-fire agreement 74 times. The enemy used weapon 18 times starting from 7 pm till midnight. Starting from 7 pm and till the midnight illegal armed groups reduced the number of provocative shelling of the positions of the ATO forces. But still there were cases when they broke cease-fire using the weapon with a caliber over 100 mm banned by Minsk Agreement. At 7:10 pm Ukrainian fortifications near Donetsk in Avdiivka village were shelled by insurgents from a tank, 120 and 82 mm mortars, grenade launchers and firearms. On Artemivsk direction at about 7 pm occupants shelled Ukrainian units located near Sanzharivka village using 120 mm mortars. Near Mariupol at 9:20 pm enemy saboteur group of 10 men with APC and firearms support were trying to go around Ukrainian positions in Bohdanivka. After a short fight the enemy retreated. On August 29, starting till midnight and till 6 am, illegal armed groups broke cease-fire 4 times. Ukrainian fortifications were shelled near Shchastya, Butovka Coalmine and Opytne with the use of firearms.